INDIAN NAVY SSC OFFICER JUNE 2017 - . 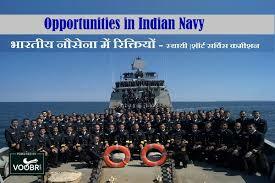 Online applications are invited from unmarried Male/Female candidates for Short Service Commission (SSC) Officer as Pilot/NAI entry of the Indian Navy for Course commencingJube 2017 at Naval Academy. Educational Qualifications : (a) BE / B.Tech. in any discipline with minimum aggregate of 60% for Pilot and 55% for Observer marks with Physics and Mathematics as main subjects at 10+2 level. For NAI - BE / B.Tech. in the discipline of Mechanical, Electrical, Electronics, Production, Instrumentation, IT, Chemical, Metallurgy and Aerospace Engineering with minimum aggregate of 60%.